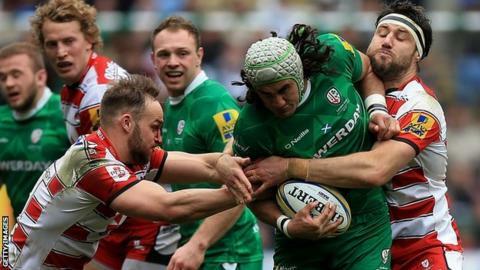 London Irish gave their Premiership survival hopes a much-needed boost with a narrow win over Gloucester. Irish remain bottom of the table but their first win since early February lifted them to within five points of second-from-bottom Newcastle. Tries from Halani Aulika and Blair Cowan and 13 points from the boot of Greig Tonks sealed victory. Gloucester slipped to their second consecutive defeat despite tries from Lewis Ludlow and Henry Trinder. With games running out, Irish desperately needed a victory and found one through a dominant set piece. Second-half pressure saw Gloucester reduced to 13 men and it proved costly as Irish scored the decisive try - Cowan going over following a rolling maul. The Exiles dominated territory and led 10-3 after Aulika dived over near the posts but Gloucester levelled before half-time with Ludlow scoring after a surge from Matt Kvesic. Gloucester, who remain seventh and five points off a top-six spot, took the lead for the first time when Trinder followed up James Hook's neat grubber kick. But Irish hit back and claimed a vital victory when Tonks converted Cowan's try before landing this third penalty late on. "It was a pretty nervy ending. Tom Court told me at the end of the game that he had to shut his eyes and run off to the toilet for the last 10 minutes, because he couldn't watch. "It was pretty tough to watch, but there was some real grit shown out there today. "We've started to come out of the other end of games now and been in touch, whereas the third quarter previously has killed us. "Today, we gave up points, but we managed to scratch our way back into the game through some pretty dominant scrummaging and good defensive work. "It's a victory, we're pretty wrapped. But we sat down and quickly gave ourselves a pat on the back and we're into preparation for Worcester away on Saturday already." "All we ask for from referees every week is consistency. There were a couple of calls there today that went different ways. "I'll leave it to other people's judgement whether or not that was a consistent treatment towards slowing the ball down at five yards out. "We'll go away and look at ourselves first as to why we lost the penalty count. That was obviously a huge contributory factor to us losing the game. "We've got to sit down and look at how we treat away games. We treated this one pretty differently to how we treated Worcester last week. "We changed two or three things in the build-up and it didn't have the impact we hoped." London Irish: Maitland; Lewington, Hearn, Williams, Ojo; Tonks, Steele; Court, Cruse, Aulika, Lloyd, Symons, Narraway (capt), Cowan, McCusker. Replacements: Paice, Smallbone, Halavatau, Sexton, Sinclair, McKibbin, Brophy Clews, Mulchrone. Gloucester: Marshall; Sharples, Meakes, Twelvetrees (capt), Trinder; Hook, Braley; Wood, Hibbard, Afoa, Thrush, Galarza, Kalamafoni, Kvesic, Ludlow. Replacements: Dawidiuk, Thomas, Doran-Jones, Savage, Evans, Randall, Atkinson, Cook. Read more on Premiership Rugby in the USA: London Irish v Saracens - the start of things to come?